Established in 1991 as a 501(c)(3) nonprofit organization, the Daily Californian Education Foundation was created to support the growth, advancement and training of college journalists at the Daily Californian. It has since expanded to support both college and high school journalism training conducted by UC Berkeley students. 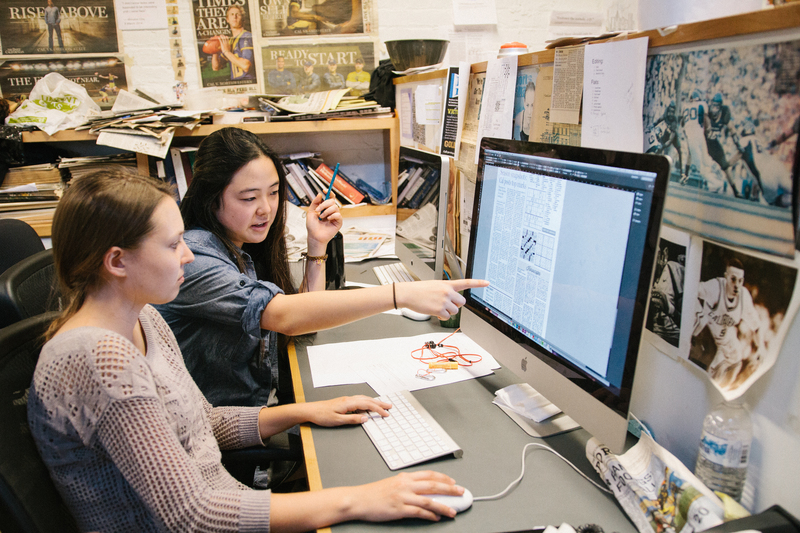 The nonprofit organization believes college newspapers provide a valuable platform for education and innovation. Historically, by supplying much-needed operational costs, the foundation has allowed the Daily Californian to provide relevant and important news to the Berkeley community. The Daily Californian Education Foundation believes journalism is a crucial method for spreading information and ideas. As the national and international media landscape changes, the education foundation continues to support strategic planning around the future of news and media. Three years ago, the foundation supported the creation of a long-term fiscally sustainable plan for the Daily Californian. Since 2004, the education foundation has remained committed to providing scholarships to students who show dedication and passion and produce superior journalism. With the rising cost of college education, providing students with funding allows them the opportunity to pursue journalism and learn valuable skills applicable to many career paths. These awards are given to students at the Daily Californian who have been recognized and nominated by their peers. 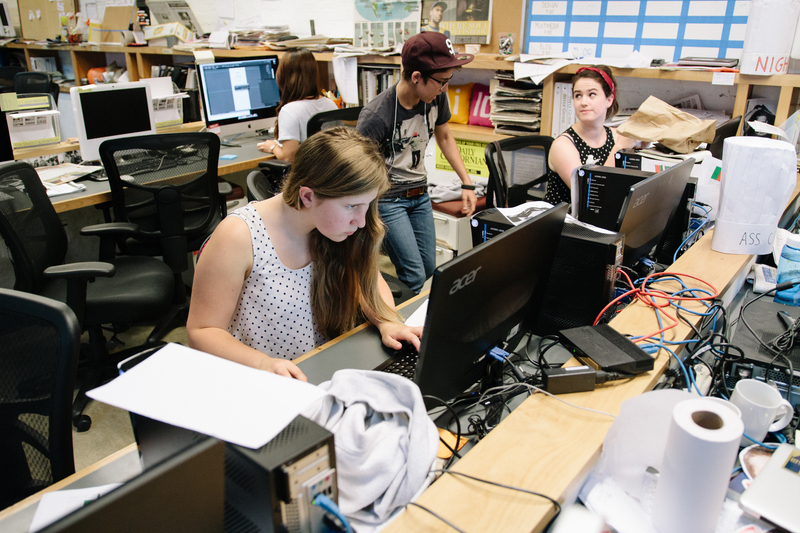 In recent years, the nonprofit has supported student journalism by improving infrastructure and encouraging innovation in the workplace. In pursuit of these goals, the foundation provided stipends for new positions focused on increasing the Daily Californian’s coverage online and in print and updating necessary multimedia and technology equipment. The foundation is supported through grants and generous donations from Daily Californian alumni and friends of the organization. The Daily Californian Education Foundation has an active board of directors that meets four times a year. The board, composed of Daily Californian alumni, media experts and business professionals, is active in both vetting programs and providing valuable expertise. The Daily Californian is the only student-run paper in the nation to have a nonprofit foundation supporting its training mission. The Daily Californian Education Foundation is a nonprofit 501(c)(3) organization completely independent of the University of California. All contributions to the foundation are tax-deductible. Donations to Education Foundation are strictly earmarked for student training purposes, which include ongoing professional guidance, scholarships for student staff members, and equipment to support the Daily Cal’s core mission to prepare the students for careers in journalism or related fields. It has no influence, however, upon editorial content or policy. Recent contributions to the Education Foundation were vital in replacing failing computer equipment with top-of-the-line iMacs for the newsroom. Other contributions have funded conference fees and equipment purchases for the photography department. The Education Foundation also grants scholarships to high-achieving Daily Cal student employees every year. In other words, it’s donations to the Education Foundation that allow Cal student staffers the opportunity of gaining daily metro news experience. The Daily Californian Education Foundation believes college newspapers provide a valuable platform for education and innovation. The education foundation gives both high school and college journalists the necessary resources, support and training to learn valuable skills in communication, collaboration and critical thinking. The Daily Californian Education Foundation supports college and high school journalism and management training conducted by UC Berkeley students in the Bay Area. The Daily Californian is an independent, student-run newspaper published by the Independent Berkeley Students Publishing Company, Inc. The Daily Californian covers both the UC Berkeley campus and the city of Berkeley. 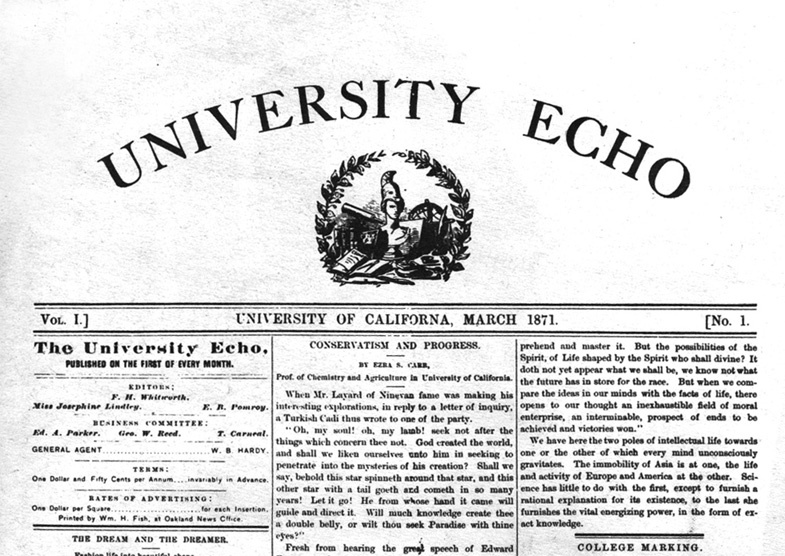 The Daily Cal first began publishing as the “University Echo” in March 1871. The newspaper publishes Monday, Tuesday, Thursday and Friday during the academic year and twice a week during the summer. 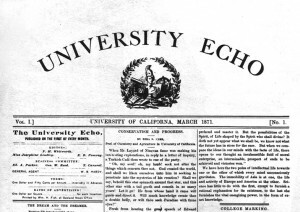 Established in 1871, The Daily Californian is one of the oldest newspapers on the West Coast and one of the oldest college newspapers in the country. The Daily Cal is run entirely by current or recently-graduated UC Berkeley students, and the majority of the business division of the newspaper is student-operated as well. Connect with current Daily Cal student leadership and staff by clicking here. One of the few campus newspapers in the country that is completely independent from the university it covers, the Daily Cal supports itself entirely from advertising revenue and does not receive equipment resources or any form of financial support from the university or from UC Berkeley’s student government (the ASUC). However, the Daily Cal does receive $2 per student every semester since 2012 when students passed a campus initiative to help support the print operations of the paper. The front-page editorial that ultimately helped make the Daily Cal independent from the University of California. 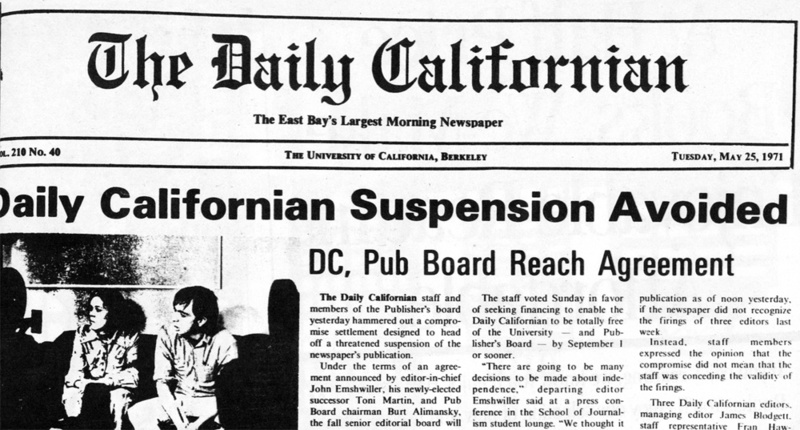 The Daily Cal earned its independence in 1971 and publishes with the name, The Daily Californian, pursuant of a licensing agreement with the UC Board of Regents. 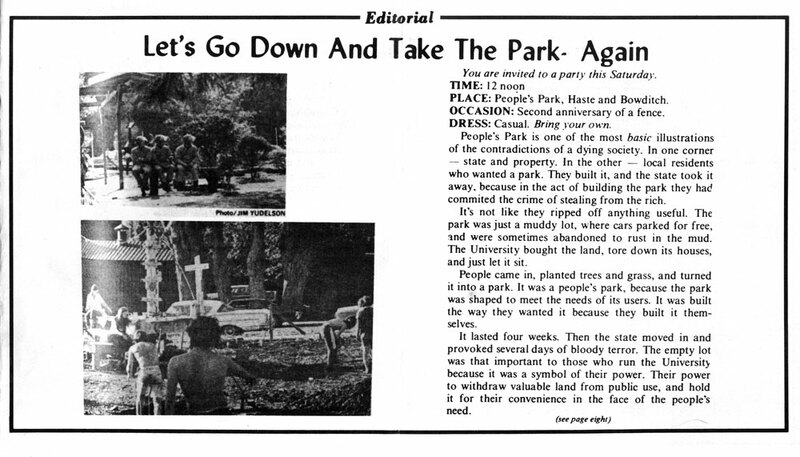 The move towards independence was initiated after the university administration attempted to fire three editors because of a controversial editorial regarding People’s Park, a university-owned lot in the Southside neighborhood of Berkeley that became an unplanned park for locals. A board of directors, comprised of Daily Cal alumni, UC Berkeley professors and working news media professionals, oversees long-term fiscal management for the newspaper. The board of directors has no control or input in the Daily Cal’s editorial policy or newsroom operations. In addition, another external board, the Daily Californian Education Foundation, oversees fundraising for the Daily Cal’s continual growth. The Education Foundation is also comprised mostly of Daily Cal alumni and also has no influence on editorial content or policy. The Daily Cal’s 1971 announcement of the agreement to separate from the university. The Daily Californian Alumni Association is a large and active alumni association. A chartered club of the California Alumni Association, the Daily Cal alumni association holds regular reunions and receptions across the country. Alumni are established and leading journalists in such news organizations as The Los Angeles Times, The New York Times, People magazine, The Arizona Republic, The San Francisco Chronicle, The San Francisco Examiner, Sports Illustrated, NBC News, USA Today and The Washington Post. In recent years, the Daily Cal has earned dozens of awards on a regional and national level for its comprehensive and high-quality coverage of UC Berkeley, the city of Berkeley and the entire UC system. The Daily Californian is an independent, student-run newspaper that serves as Berkeley’s paper of record and trains students in areas of journalism, business and other professional industries. 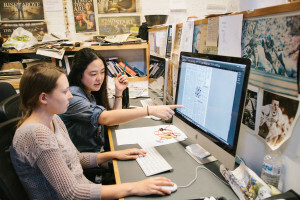 Students hold all editorial positions — including writing, photography, design, copy editing and illustrating — as well as most business positions. The Daily Cal prides itself on being the best source of journalism training on campus, as well as a business training. When working at the Daily Cal, you know your work makes a difference. The articles written by reporters at the Daily Cal spark discussions and action from community and campus members. The Daily Cal covers Berkeley 24/7, teaching students how to be prepared for any situation. When an explosion rocked UC Berkeley’s campus in spring 2013, the Daily Cal’s articles and photographs were picked up by outlets across the nation. In recent years, the Daily Cal has earned dozens of awards on a regional and national level for its comprehensive and high-quality coverage of UC Berkeley, the city of Berkeley and the entire UC system. In 2016, the Daily Cal won 23 awards from the California College Media Association. For a list of recent Daily Cal awards visit our website.